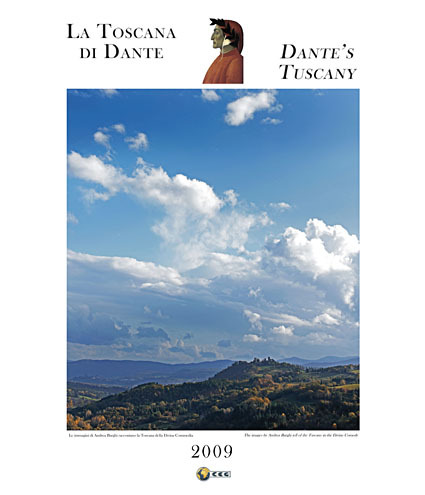 Inside the Divine Comedy the references by Dante to Tuscany are numberless and, after over seven hundred years since it was written, we invite you to discover and see them under a new light, that is the images the author wanted to catch out of time. Beginning from Dante’s tercets, we have started our journey searching places keeping an ancient spirit and giving the reader the feeling of being the poet’s contemporary. Dante’s words have the power of casting our mind almost physically into a space which is not only medieval but eternal. The fertility and the depth of the poet’s lines pass over the centuries and show us, through vivid pictorial descriptions, hills and streams, towers and cloisters , through Dante’s own eyes. The strong fascination exerted by his genius and his work has had a great part in the realization of this publication. As Tuscan people it was exciting to have the guide of such a “supreme” predecessor… able to write always modern and innovating lines and a great model for our life. PHOTOGRAPHY, ADVERTISING, GRAPHIC DESIGN, PUBLISHING, MUSIC, ILLUSTRATIONS, SHORTFILMS... in a word CREATIVITY!